So you think you need an expensive camera to get good photographs? Crappy camera = crappy photos? Does your old, cheap camera have you convinced you can’t pursue photography with the passion you know you have? If so, you’re a victim of the cheap camera myth. Read on. Your camera has nothing to do with your ability to LEARN photography. So if you read no further, arm yourself with a cheap camera and get out there! 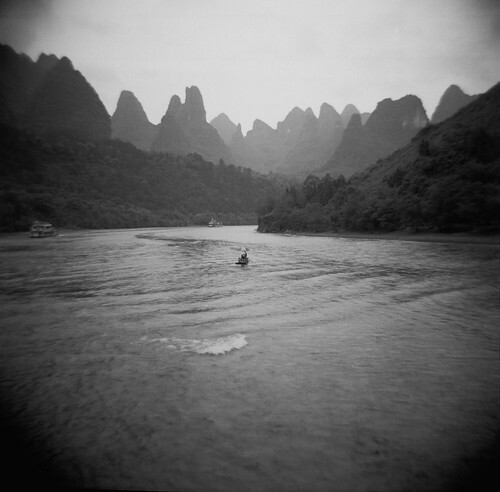 The photo above on the Li River near Guilin China was taken with a $50 camera called a Diana. The Diana is a medium format film camera (now available with a 35 mm back) with a plastic body AND plastic lens. That’s right PLASTIC. Not Zeiss. The vignetting is inherent. The photo is SOOC – straight out of the camera. I liken the Diana to Forrest Gump’s box of chocolates — you never know what you’re gonna get. Every photo is a surprise — and I like that. While dependability is critical when you need to count on the outcome, the point here is that even with a $50 camera, the potential exists for something you’ll be proud of. P.S. this is more of a Rah! Rah! session than a lesson. Sometimes motivation is the required pre-requisite. I don’t consider any of my equipment “cheap”. Although much of it was inexpensive (some even free), every camera in the SRT arsenal is capable of taking great photos, even artistic photos. And who says you have to have new? All my equipment has been purchased USED or given to me by friends in lieu of a garage sale death. The cameras are different, with results that span the photographic spectrum from the full framed digital workhorse, the Canon 5D, to the dreamy, you-must-be-high-on-something appreciation that comes out of the Polaroid SX-70 land camera. That’s right, an instamatic film camera that was introduced in 1972 as the first “instant SLR”. And great fun at parties. A cheap camera, an old camera, an outdated camera, an outdated cheap old camera is NO reason to not pursue your interest in photography. More visual aids, please! The two above were taken with the Diana. Inherent light leaks and vignetting mean unpredictable results — a beautiful thing if you’ll just cut the tethers to the digital it-must-be-exactly-as-presented-in-real-life standard. So you say I had exceptional scenery/characters for the photographs with the Diana? 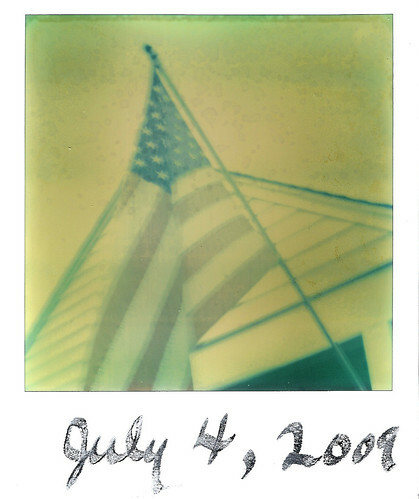 Here’s one taken over July 4th with the Polaroid SX-70. Stepping up in price range, the Sony DSC-T100 Cyber-shot at $400 is my favorite camera for trips to the grocery store, and for macro shots. With a Zeiss lens, the photos produced are hard to beat. After viewing this photo again, the results are hard to beat. Period. If you’re still unconvinced photography can’t be pursued with a cheap camera, shoot with one for 2-3 weeks and report back. Sometimes it’s the simple exercise of carrying the camera around and tripping the shutter that overcomes our excuses. Check out the Lomography website if you’re interested in exploring film cameras. 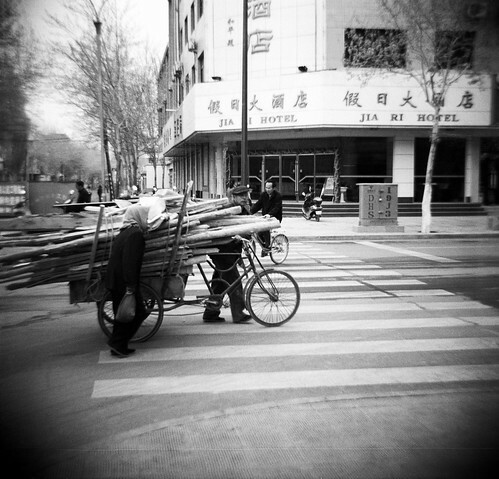 And “Lomo” is simply a term for experimental analogue photography — nothing more exotic than that. The prices range from $50 for the Diana, to $350+ for the Lubitel 166+. If you’ve fallen for the “cheap camera myth”, start with the $50 Diana. 1- a celebration of the adventurer in all of us; 2- discovery of the lost art of solitude; 3- to pry oneself from the easy chair and move one step out of our comfort zone; 4- traveling alone exploring the unknown for at least two nights away from home preferably via foot or a 4 wheel drive vehicle. It’s amazing the possibilities of Saran Wrap, Vaseline, and Water when mixed with a camera lens. Well its hard to believe that all those pictures were actually shot from a cheap camera these are very impressive thank you for posting. formatting issue or something to do with web browser compatibility but I thought I’d post to let you know. It’s odd how we equate price with product when it comes to photography. Seriously, I’ve never heard someone draw a correlation between a fancy guitar and a great song. The old bluesmen weren’t playing four thousand dollar guitars and they didn’t have the luxury of pitch correcting software either. A guitar is only as good as the person playing it…the same goes for a camera. I love the post. Although I still want a camera with a lot of bling and I probably won’t be snubbing my nose at a fancy guitar any time soon either. This piece reminds me of a conversation we had with a Canadian photojournalist whose mother always said, “Your photos are great. You must have a good camera.” As if her daughter had nothing to do with the composition and outcome of the photo! Although we do carry a DSLR camera now, it’s not the camera that makes photo great it’s the vision of the photographer behind it. Thanks for reminding us about this. Heck in today’s world it seems like we’re trying to mimic cheap cameras like the Holga and Polaroid. 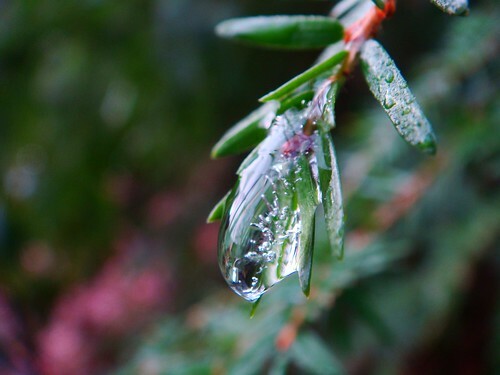 I love my Canon 5d Mark II but my six year old inexpensive digital has taken some beautiful shots throughout the years. Certainly people shouldn’t feel constrained by their cameras. I recently saw a photo project where all the pictures were taken on a cell phone camera and looked great. PS – I just remembered… my 88 year old grandfather got some of the best pictures from his front row seat at my wedding ceremony. amazing shots, really. he was using a $5 disposable camera. nuff said. Great post. One of my favorite websites is Orangette and she uses a plain old Polaroid camera to take her beautiful pics. The tool is important but, more importantly, is the eye and the desire to take photos. I sent you a separate email to address your Polaroid film question (yes it is very difficult to find!). YES, it’s the skill of the person clicking the shutter, not the equipment itself that creates something pleasing. I wanted to establish this base of inspiration before going on to discuss ways to improve your photography. That’s next, so check back! Kerrin, Jen, Pops, Tzaadi, Amy, and Daniel: It SO has nothing to do with the thing you hold in your hand! Like Kerrin said, she’s amazed at the quality of photos coming from her parent’s cell phone. Pixel count is so over-rated! I wanted to get this bit of a hurdle out of the way before I started talking about more technical How-To’s. It is the How-To’s that make great photos with cheap cameras possible. BUT the fact you don’t know much or anything about photography is stopping some people from even LEARNING. They’re held back by the fact their equipment is old or outdated. I had to get this point across. It’s been gnawing at me. So I’m really pumped that you all liked this post and felt inspired by it. Besides, as all of you already know, lugging around old/cheap camera equipment is very hip now. And like a friend of mine says, looking cool is really important. LOL Thank you for your comments! See, now I know for sure we are kindred spirits! 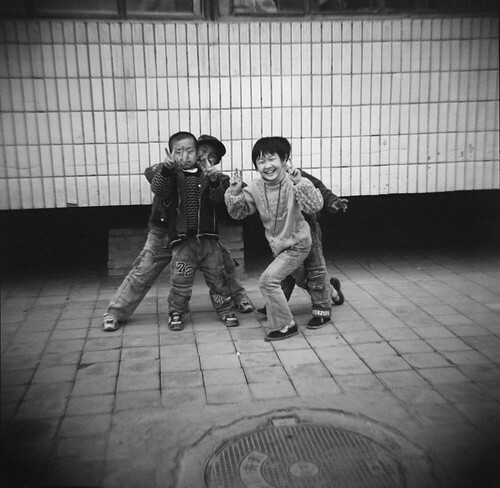 You with your Diana F+. Me, with my Holga! I ordered a Lubitel 166+ online the other day. I can’t wait to test it out!! Hey, it’s back to old school! What’s old is new again! That’s amazing! I think also it’s also the ability of the photographer to capture it with great composure. 🙂 Your pictures are amazing! I’m in love with Diana. Great shots. You prove it’s the eye…not the tool. Thanks for the inpiration just to take the shot.! Wow, I’m checking out Dianas on eBay — I like what you had to say about cutting the tether. I’m guilty of having fallen for the ‘cheap camera myth’. But not of lat — cutting back and saving for our upcoming round-the-world has caused me to reconsider my gadget addiction. But the Diana is something I can get behind. This may be a stupid question, as I’ve heard they’ve stopped producing Poloraid instant cameras — is the film still widely available? Thank you Tammy. This is an important post. Because I have yet to invest in a digital camera save the one in my phone, I hesitate way too often to capture scenes. I’m taking your advice. About SRT... I’m a traveler, writer and photographer for whom the open road frequently summons. Adventurous solo road trips are a staple for me, and a curiosity. So I created this website to share them and inspire you to step out and give them a try. Welcome! Copyright © 2009-2019 SoloRoadTrip.com. All rights reserved. Reproduction in whole or in part without permission is prohibited.